Earn up to 24 MountainPoints. A beautiful combination of colors and textures with a hint of sparkle gives this lovely headband just the right touch! You can use it for those precious newborn photo shoots, add it to any outfit as a fun and unique accessory or give as a gift. It also makes a pretty addition for flower girl outfits. I can make this headband in any size from Newborn to Adult. 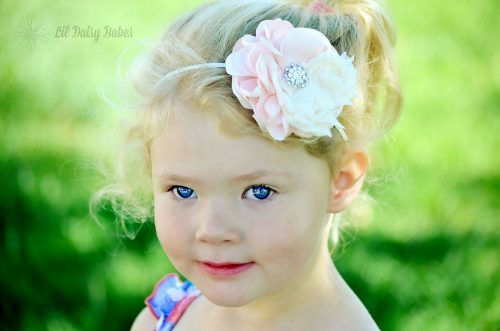 This headband uses 1 blush pink flower, 2 cream colored shabby flowers and a rhinestone embellishment in the middle. It measures approximately 3.25″ across and is attached to a 1/8″ cream elastic band. Since each headband is made to order and features 3 flowers that are handmade individually for every headband, small differences may occur. This item is made to order, please allow 3-5 days for me to specially make your headband. Color shades may vary slightly due to dye lots, computer screen variations and photography editing. I truly try my best to accurately display the color for you! All items are made in a smoke free and pet friendly home.